Leaving notes for yourself on the bathroom mirror is a tried and true method of reminding yourself of something important. There are a number of ways to get the message across though, find the one that is right for you. This is a guide about using your bathroom mirror for reminders. When I am in the bathroom each morning putting my makeup on and doing my hair, I am always thinking of things I need to do (Dr. appointments, errands to run, calls to make, gifts to get, birthday reminders, etc.) or stuff I need to buy at the store. One day I had a dry erase marker in my bathroom drawer (why I even put it there in the first place is beyond me). I got it out and began writing my thoughts on the mirror. Wow, this was a life saver for me! When I'm done in the bathroom I transfer the list to paper and put it in my purse immediately. If it is something that needs to be done around the house I leave it on the mirror until it is done (or if company is coming over, I write it down elsewhere). I hope this works well for you too! Both of my children are growing up and getting more involved with their own activities, as they should be. The challenge is keeping track of who needs to be where, when and with what. So, we write notes to each other on the bathroom mirror with dry-erase markers! Everything from "late start today" to "orthodontist appt at 3:30" to "please take out the trash" or just "I love you!" My daughter writes her work schedules (multiple jobs) on her mirror, so I have a clue where she might be at a given time. The dry-erase markers wipe right off whit a washcloth or piece of paper towel. I have been using dry erase markers on my bathroom mirror to list appointments and things to do. You can use a different color for each subject and/or family member. When you need to leave a note for the kids, spouse, cat sitter, etc. write it on the mirror with a white-board (dry erase) marker. The marker will come off with a swipe of a kleenex or washcloth, and you'll be relatively certain they saw the note. I leave notes to myself on my bathroom mirror if I remember something I need to take to work the next day. I also leave notes for my daughter on the hall mirror where she does her makeup before school. She leaves notes for me on the same mirror. It works! When I need to do something in the AM, I jot a note on the bathroom mirror with a dry-erase marker at night. I see it as I am dressing and brushing teeth, and I can then wipe it off the mirror with a tissue. 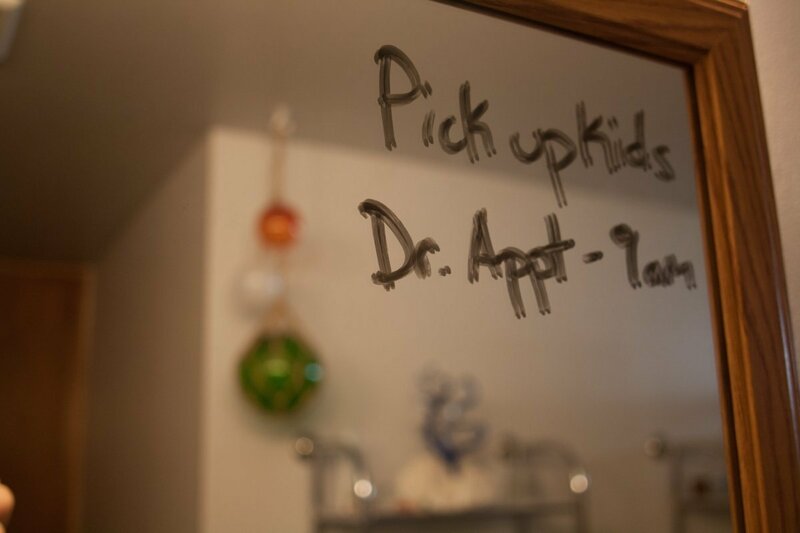 Hang small dry erase makers beside all the mirrors in your house and when you think of something that needs to be done or something that you need to buy, grab a pen and write it on a mirror! With a busy schedule, leaving notes and messages becomes a 'way of life'. I got tired of the kids 'not seeing' the notes I left, so I came up with a way I knew they couldn't miss. I use dry erase markers on their bathroom mirrors. To remember something for the next day, I use an old/stale lipstick to write a one-word reminder on my bathroom or vanity mirror. I keep a dry-erase marker in the bathroom and write myself a note right on the mirror to remind myself of something for the morning. Wipes right off with a tissue!